Penalty heartbreak ensured that Whitby Town will face Celtic in their own Challenge Cup third-place play-off, after losing 4-2 from the spot to AZ Alkmaar. Visitors Alkmaar took a first-half lead, through Ferdy Druijf, which was cancelled out by Mikey Roberts in the second half. It was the Dutch visitors who opened the scoring, with barely two minutes on the clock. Matthis Hardijk found space on the right side, before sending a cross into the box to Druijf, who finished past Shane Bland in space, with plenty of time to do so. The goalscorer then forced a good save from the Blues stopper about 25 minutes later. Only Bland’s legs could see the ball over the crossbar from Druijf’s low, driven attempt. 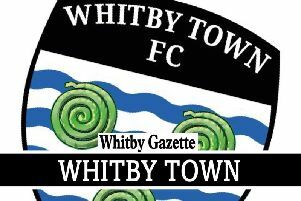 Whitby, however, created chances and could have equalised on 35 minutes. David Carson found space on the left-hand side, before crossing to Mikey Roberts, who could only fire wide, first-time, at the back post from six yards. Just seconds later, Alkmaar almost doubled their advantage. Viktor Einarsson opened up space with his first touch, before driving a low shot across the face of goal. His effort, though, could only go wide. On the stroke of half-time, AZ were disappointed in front of goal again. Alkmaar danger man Druijf was again found in space. He got a shot away from 12 yards, one-on-one, but was again denied by a smart save. The visitors continued to look strong, and that man Druijf continued his battle with Bland just after the break, firing a shot at the Blues stopper, before Niall McGoldrick cleared a follow up off the line from Hardijk. Whitby were the ones who found the back of the net, however, despite Alkmaar seeing more of the ball. Dan McWilliams burst into the visitors’ box, getting to the byline. He cut the ball back to Mikey Roberts, who fired a low effort past Jasper Schendelaar. Drama occurred just two minutes later, as an unusual pre-season red card was produced, leading to Alkmaar almost regaining the lead. A foul from Niall McGoldrick prompted referee Alfredo Sandoval to produce a second yellow card for the young centre-half, with the resulting 25-yard free-kick from Jonatan Ingi Jonsson cannoning back off Bland’s upright. Despite the man advantage for AZ, it was Whitby who continued to look threatening. Adam Gell found David Carson in space, who drove a low shot across Schendelaar's upright and wide. He then threatened again, with a powerful effort towards the Alkmaar near post, forcing a reaction save from Schendelaar. Neither side, however, could find a second goal, ensuring a penalty shoot-out. It was Alkmaar who stole the show from the spot. Pantelis Hatzdiakos, Justin Bakker, Mees Kaandorp and Rens Van Der Wacht slotted home in style, whilst Mikey Roberts' and Luke Bythway's skied attempts ensured disappointment for Chris Hardy's men. AZ Alkmaar: Bucker (Schendelaar '59), Church (Jacobs ’59), Hatzidiakos, Bakker, Kramer (Groot ’59), Hoedemakers (Muhl ’59), Hardijk (Van Der Wacht ’59), Einarsson (Kurban ’69), Druijf (Kaandrop ’59), Jacobs (Jonsson ’59), Koreniuk (El Hasnaoui ’59). Subs not used: Schendelaar.